This essay is about software, not the real world! If you're interested in my thoughts on real world rural policy issues, check the Rural Policy category on the right. Non-nucleated settlements, where dwellings are scattered at least tens of metres apart over quite a wide area; highland crofting settlements are typically of this form. Nucleated settlements, where dwellings are grouped closely around a central feature such as a village green or a pond; villages of this form are typically older villages, especially in areas of Anglian settlement. Rhonehouse is a good example locally. Linear settlements, which are a special case of nucleated settlements, where dwellings line the sides of an (often broad) street. 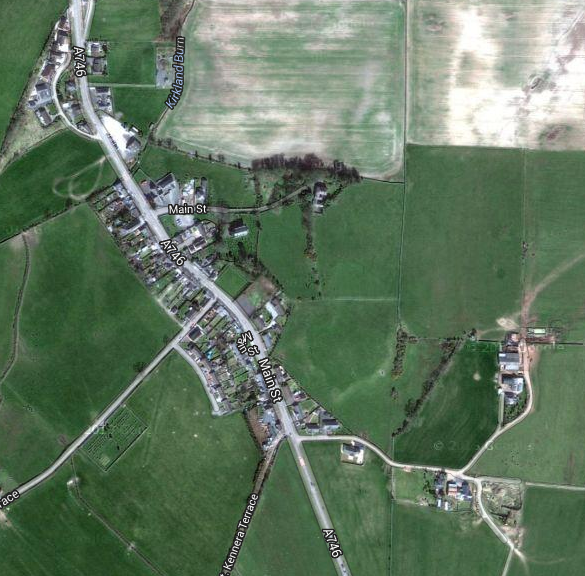 These settlements typically are medieval in origin and reflect the runrig agricultural pattern - each house had inbye land stretching back from the street. Moffat, Lochmaben and Thornhill are local examples. Stamfordham, Northumberland: a typical nucleated settlement centred around a village green. 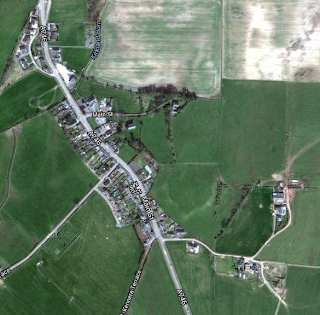 Field boundaries to the north give clear evidence of runrig agriculture, while the south side shows the growth of closes and alleys. In nucleated settlements generally, as the settlement grows, alleys and lanes form stretching out from the original grouping. Edinburgh's old town is an example of a linear settlement which grew in this way. Older, unplanned rural settlements do not have a regular street plan - that's a feature of quite advanced urban societies. In creating a mechanism for settling a convincing, naturalistic virtual world, these patterns need to be born in mind. This is complicated by a number of issues which are driven by technology (and perhaps by my lack of skill and imagination); I want to avoid as far as possible technological issues introducing visible artefacts into the virtual world. Currently I'm working on a grid of 100 metre square cells. This isn't ideal at all, but it's simple and at the stage I'm at in developing algorithms that simplicity helps. 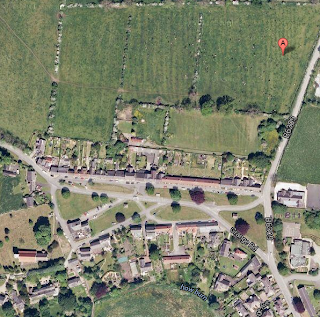 But naturally, things people build are not always square and certainly not always aligned to a north/south grid. 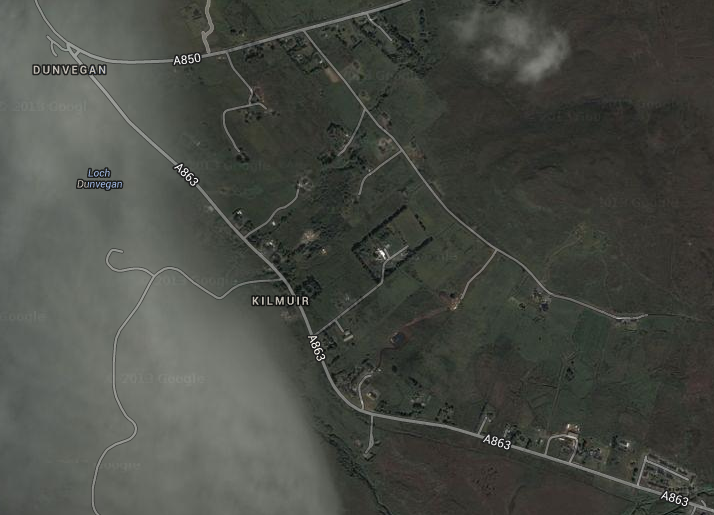 Dunvegan, Skye, a non-nucleated settlement. Dwellings are set on their individual crofts, scattered across the landscape. From the point of view of settling farmers, a 100 metre square grid - one hectare to a cell - is adequate; I'm working on the principle that my sort of roughly bronze-age to late medieval farmers can manage between four and six hectares per household. As farmers will naturally cluster together in areas with better soil fertility and shallower gradients, and so that 'naturally' models the non-nucleated settlement. Within any non-urban holding, the dwelling house should gravitate to the edge of the holding nearest other dwelling houses - a gravitational algorithm is precisely right to do this. This will provide the beginnings of clustering. As you'll see in my note on Populating a game world, when a non-nucleated settlement of farmers reaches a certain size, it begins to attract craftsmen. Among the first of these is an innkeeper; to support an innkeeper requires ten other actors dwelling within walking distance (say a ten cell - one kilometre - radius). When an innkeeper settles, he reserves a set of four to six cells, close to sufficient potential customers, and ideally adjacent to a cell already designated as road. One of these cells becomes the inn yard, where the inn and its outbuildings are sited. One adjoining the inn yard becomes 'urban open space', which can't be built on - it's rendered as a village green until the village reaches a certain size, then paved square. If possible the 'urban open space' cell will be placed to border both the inn yard cell and a cell designated as 'road'. Other cells from the farm are designated as 'urban'. Similarly, when an aristocrat settles, he will reserve one cell for his castle, one for a 'market place', and four more as urban; a market place will subclass an urban open space and so will prefer to be located adjacent to an existing road. The castle will normally be on a hilltop, except where there is a river crossing, which would be a preferred site. There's probably some algorithm I could find which would lay out wee twisty streets and arterial roads in a naturalistic fashion... If cells which are designated 'road' adjoining 'urban' cells get redesignated as 'arterial', that's probably a good first step. Arterial cells have dwelling plots lined either side of a broad street, and one lane off either side. An arterial cell alongside an 'urban open space' may have no dwellings on the side towards the 'urban open space', giving in effect of a larger urban open space. Land use types 'urban open space', 'arterial' and possibly others will subclass 'urban', or share a common interface. Kirkinner, Wigtownshire: a linear settlement. A settlement with mainly arterial cells should give a fairly good model of a linear settlement. As a tweak, it's possible that urban cells adjacent to water cells could become dock cells. A number of pre-planned (that is, designed) ground plans will be created for 'urban' cells, such that they will tessellate together to give an impression of irregularity. Urban cells have up to twelve dwellings per cell. Dwellings in urban (and arterial and 'city wall' cells, see below) are erected in preplanned locations within the ground plan - generally, facing the most significant street which abuts the plot. Although urban cells have plots for twelve dwellings, they won't automatically be occupied. Rather, a new craftsman setting up shop will occupy a free plot in an existing urban cell, and will only create a new urban cell if there are no free plots available. In selecting a plot, the available plot with most occupied neighbours will be chosen. Where more than a critical number - say 15 - urban cells are clustered together, the outermost will become 'town wall' cells. An outermost arterial cell will become a 'town gate' cell. Again, preplanned ground plans for 'city wall' cells will be created, with wall models. These will be designed to fit together in ways which are not obviously square and grid-aligned. There is a slight problem with this which is that to get to town wall status would take at least 180 households, which is quite a lot for my game economy; this implies walled towns will be relatively uncommon, which is fair enough. However if, as a slight fudge, journeymen and soldiers each have their own dwelling instead of living in their employers' dwelling, the number of households will grow faster. Buildings in urban cells will just be genetic buildings like anywhere else, except that the fact of being in an urban cell should give an emphasis to building upward. Arterial cells will promote taller buildings even more strongly than other urban cells.